Off the Wall fuses local and Okinawan cuisine, overseen by executive chef Grant Murata, who feels the tug of purists and those who prefer that their food keep up with the times. OFF THE WALL started with the idea of being different from anything else out there. Any business that dares to be different has to be prepared to confuse the heck out of people, me for one, and others, according to executive chef Grant Murata. There's confusion by association because Murata's known in Okinawan circles as a musician, in addition to his past affiliation with the Okinawan restaurant Hanagasa Inn. There are many old-timers who depend on him for traditional local Okinawan fare, while a younger generation expects a lighter hand, free of oil and extracting the bitterness from bittermelon. He says he's feeling the pressure from both factions while also trying to please that other faction of newbies who don't know a single thing about the restaurant and can't even guess based on its name. My first impression was that the restaurant is a work in progress, trying to find its way on the unfamiliar turf of the Pearl Kai Shopping Center in Leeward Oahu, in an uncertain economy at that. It's at first glance a daytime and early evening family restaurant with a local/Okinawan bent, easing into izakaya territory later in the evening. As per its name, Murata and his partner Kyle Matsumoto have creative culinary ambitions, so the menu continues to be tweaked to accommodate the community. It's difficult to judge a restaurant on these terms because part of a critique involves measuring a restaurant by the standard the restaurateur has set; what he or she wants the place to be. It's usually obvious because there are only about a dozen clear-cut restaurant "templates" to follow. But, like I said, Off the Wall aims to be off the wall, so only they can provide the definition. For now, I think I'll call it a local hole-in-the-wall, one with a lot of Okinawan inspiration and some upscale ambition, with plate-lunch dining by day, and izakaya-style helpings at night, with rice ordered separately. Here, won tons ($6, evening only) are filled not with beef or pork but with surimi and goat cheese. Ahi poke ($9, evening only), with the usual soy sauce, onions and sesame oil and sprinkling of coarse Hawaiian salt, has the extra crunch of sliced cucumbers. A quartet of shrimp ($8) wrapped in apple-smoked bacon is served on artfully arranged skewers. The arrangement doesn't last long, with the enticing aroma of bacon being its downfall as it's devoured in seconds. 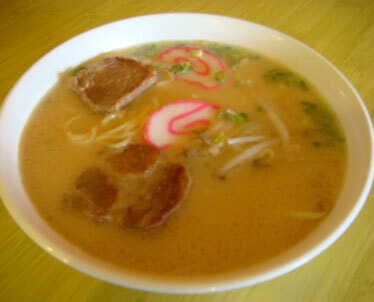 Shoyu pork ramen is one of the lunch specialties offered at Off the Wall. Key to the Okinawan portion of the menu is Off the Wall's "champuru," or stir-fry mixes of tofu, vegetables and pork ($8 day/$9 evening), or traditional combination of "goya" (bittermelon), pork and tofu ($8/$9). Murata, who travels to Okinawa once a year to check on its culinary process, said food there has changed to incorporate more of the trends from Japan and its other Asian neighbors, and he would like to follow suit, though there will likely be resistance. As with many other Asian cultural practices, Hawaii has become a time capsule for traditions as practiced when our ancestors immigrated here. Why this has become such a phenomenon I don't know, even though I've long been aware of it. Maybe someone can just tell me their theory as to why people in Hawaii are so resistant to change. Murata's Okinawan shoyu pork soba pasta ($9, evening only) is an example of the new, having eased up on the oil and incorporating a beurre blanc sauce for a European vibe. A duet of Okinawan shoyu pork ($11 evening/$10 day for Okinawan style only) provides a nod to the local and the Okinawan sensibility with its combination of soy sauce marinated, slow-cooked pork, as well as sweet awamori-soaked pork belly rafute, that simply melts on the tongue. Hamburgers ($8/$12) are homemade with a mix of Kobe beef, onions, tofu and panko, and all the shells are removed on "no hassle" garlic shrimp ($11/$15) sauteed with onions, garlic and butter with a touch of sake instead of the usual white wine. 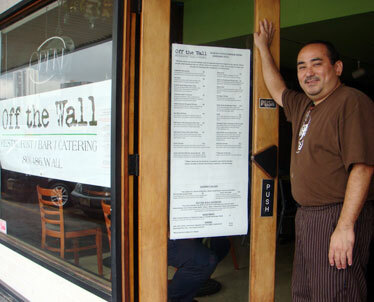 I would love to see how Off the Wall's clientele shapes up. Murata said: "People like to have a place where they can have Okinawan food and people have been coming because of me. They're confused, maybe, but as they try the food, they seem to like our take on it." As to whether he has taken it upon himself as a mission in life to promote Okinawan cuisine, he said: "I don't know if it's my mission in life. I thought I wanted to be a musician but I'm glad I found something else I can do."